The best-selling Sword of Rome novellas are collected together for the first time in one epic collection. Sword of Rome: Standard Bearer, the first book in the series of novellas featuring Lucius Oppius and the campaigns of Julius Caesar. The centurion Lucius Oppius has left the battlefields of Gaul to venture to Rome. But he is about to discover the capital of the Empire can be every bit as dangerous as its provinces. Under orders from Caesar to secure an item of intelligence that will help him become a Consul again Oppius is manipulated into taking part in a gladiatorial contest. The soldier must not only fight his enemies in the arena however. Marcus Porcius Cato warns “Caesar’s Champion” that victory inside the arena will bring death outside of it. Oppius soon discovers that while in Gaul your the enemies stand before you in a shield wall in Rome they stab you in the back. 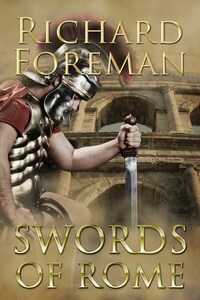 ‘Swords of Rome’ is an action-packed collection that takes you into the heart of the ancient world. Praise for Augustus: Son of Rome. Praise for Raffles: The Complete Innings. Praise for A Hero of Our Time. ‘Where else can you time travel to Ancient Rome for a whole evening for less than the price of a pint!’ – General Parmenion. Richard Foreman is the author of numerous bestselling kindle books, including Augustus: Son of Rome and the Raffles series of historical crime novellas. He is also the author of A Hero of Our Time, a literary novel set during the end of the Second World War. He lives in London.